Water-to-water heat pumps are an excellent choice to provide water heating and water cooling for a wide range of applications. Whether the product is used for pools, commercial aquariums, radiant floor heating, ice melt, chilled water applications, industrial process water, or to provide precisely heated or cooled water for fan coils or other applications, WaterFurnace products are designed to perform to the highest standards in the industry. Large in capacity but compact in size, these units will fit through most doors for easy installation. 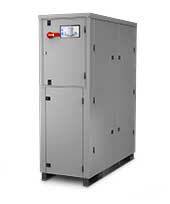 High efficiencies are obtained using scroll compressors — two are used in the dual circuited unit. Units are controlled using HydroLink Aurora controls which marry the field-proven Aurora compressor management with the HydroLink NiagaraAX-based system level controller to manage setpoint, control, staging, and the 10â€ color touchscreen HMI tablet display while communicating over 200 points to the BAS network via BACnet, LonWorks, or through the NiagaraAX bus. The unit's brazed plate heat exchangers are constructed with 316 stainless steel for long life. Non-ozone depleting R-410A refrigerant is used.